Tobey VanderLaan and his daughter, Shellby, run the family sunflower seed business near Mound City. Wayne and Shirley VanderLaan were busy enough running a farm near Mound City that they never thought about jumping into the sunflower seed business. So how have the family’s Wild Dutchman Sunflower Seeds come to be eaten in all 50 states? It began with a few small batches that Wayne roasted on his kitchen stovetop. He’d bring them when he and his son Tobey traveled for their auto repair business, and shared them with family and friends, all of whom said they were the best seeds they’d ever eaten. To keep up with demand, three additional dehydrators joined the one already busily turning out seeds in the VanderLaans’ kitchen. Eventually Tobey renovated his hunting lodge into a processing plant to accommodate three large homemade dehydrators. Tobey and his daughter, Shellby, largely run the family business, though Wayne and his wife Shirley — who is happy to have her kitchen back — still help. Editor’s Note: This story is revised from the November/December 2015 issue of South Dakota Magazine. To order a copy or to subscribe, call (800) 456-5117.
can I have your address to order your sunflower seeds. where can i buy these in the State of Minnesota, i live in Chanhassen MN. i sure would love to have some of these on had for ice fishing and fishing in general. Just a quick note to say how proud I am of Wayne's family business. I got to know Wayne while being employed with Norwest Bank in Mobridge. Good for you. I've been eating seeds for 30+ years. These are by far the best & made me switch from Giants, which are made in North Dakota. Congrats on your success! 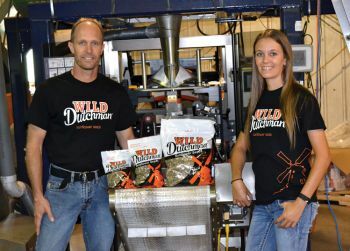 I believe we were one of the first distributors for Wild Dutchman Seeds. They are the best on the market. Totally outsell other seed brands. Once you start eating them, you can't quite! We throughly enjoy doing business with you! Wild Dutchman Seeds sound good enough to eat. I'd like to taste them. Where are they available to me. I live in Fond du Lac Wisconsin. I was born in Mobridge,SD 75 years ago. My dad used to preach in Mound City. I believe that we used to know a Kluckman? family from Mound City. Even as a young child I loved South Dakota. It was nostalgic to read this seed story from Mound City, SD. Where can you by the t/shirts you both are wearing? Your seeds are great, the seeds are so meaty inside, love that! Both of us were born and raised in the Dakotas, so we know good from bad sunflower seed and these are "GOOD"! Keep up the good work!!!!! Love the name of your product, so fitting, "Wild Dutchman"! Waiting to hear form you about the shirts! I carry a bag of Wild Dutchman in all of my vehicles and have grabbed a handful at times before I even start the vehicle. Love them. Keep up the good work. I grew up between Glenham and Mobridge, but now my husband and I live in Watertown, SD and I make it a point to pick up your sunflower seeds at County Fair foods because my husband and I love them and the fact that they are made close to where I grew up just makes me like your product even more. Hi Shelby!!! I love those seeds!!! Buy them all the time. Best seeds ever! Only ones we ever have in our house, car, camper! Literally the best seeds ever! Thanks Scott A for introducing them!